Former Boston television news anchor Heather Unruh wipes tears while speaking Nov. 8, 2017, in Boston about the alleged sexual assault of her teenage son by actor Kevin Spacey in the summer of 2016 on Nantucket. A former television news anchor is accusing Oscar-winning actor Kevin Spacey of sexually molesting her son last year when he was 18 years old. An angry Heather Unruh told reporters Wednesday that the alleged incident occurred in a restaurant on Nantucket island, a popular Massachusetts tourist spot. "Kevin Spacey bought him drink after drink after drink, and when my son was drunk, Spacey made his move and sexually molested him," she said. Unruh said her son panicked and could not remove Spacey's hands from his pants. He ran out of the restaurant to his grandmother's house when Spacey left the bar to go to the bathroom. Unruh described her son as being "starstruck" by Spacey, but also too embarrassed to call the police at that time and waited until just last week. FILE - Kevin Spacey arrives at the 4th Annual Reel Stories, Real Lives Benefit held at Milk Studios, April 25, 2015, in Los Angeles. She said a criminal investigation was underway. But Nantucket police would not confirm or deny an investigation, saying Massachusetts law barred them from discussing sexual assault allegations. "I just want to see Kevin Spacey go to jail," Unruh said. "Not just for my son but for the many others." 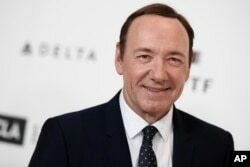 At least two other men accuse Spacey of sexually molesting them when they were teenagers. British news reports say London police are also looking into an alleged sexual assault there in 2008. The actor, who recently came out as gay, said he did not remember an alleged encounter with actor Anthony Rapp when Rapp was just 14. But he apologized if there was such "drunken behavior." Netflix has fired Spacey from its hit television series House of Cards. The show-business newspaper Variety also reported that Sony Pictures had pulled a new film starring Spacey, All the Money in the World, from the upcoming American Film Institute film festival.